Yesterday, I travelled to the end of the world. It was a short bus drive away. Who knew that it was so close? Yesterday, I travelled the “rest” of the Camino, the part reserved for die-hard pilgrims for whom the majestic cathedral in Santiago was not enough. I travelled along the a costa da Morte, the Death Coast, so named for the multitudinous ship wrecks that have happened in these often stormy waters off the coast of Galicia. The end of the world, the death coast, is, as it turns out, beautiful. Most pilgrims end their journey at the Cathredral in Santiago de Compostela but a few hardy ones go an extra 89 km (55 miles) to Finisterre which does, indeed, mean the end of the world in Latin. It was so named because when the Romans reached this finger pointing out to the horizon of limitless water, and, believing that the world was flat, after all, they thought they had done it!! Reached the end of the world, beyond that vast expanse of blue, they figured, was a giant waterfall spilling endlessly into infinity. Of course, now we know, as Cris, the helpful tour guide to the end of the world, told us that directly across the water from where we stood was Boston, MA. Known to us Unitarian Universalist as the Alpha and Omega; the beginning and end of the world. It really was an amazing day, though, and I’m glad I took the time to do the tour. I often think of bus tours as cheesy for some reason. I do happen to live in a tourist attraction (Colorado Springs: home to Garden of the Gods, America’s Mountain, and, now, legal weed!) and so I’ve see tour buses go by, so that might be part of the reason for my bias, but really, I love doing tour buses. And every time I do I learn so much about the area through which I’m traveling and gain a deeper respect for the region, the terrain, the people that live there. Yesterday was no different. We traveled first to Muxia,(Spain, not China, despite what Facebook might say) which is where the final scene of the Camino was shot in the movie, “The Way.” For those of you who haven’t seen it, “the Way” was written and directed by Emilio Estevez and starred his dad, Martin Sheen, playing, well, his dad. In the movie, Emilio dies on the first day of the Camino and his dad decides to walk it and spread his ashes along the way. It’s a great movie. Anyway, it ends in Muxia which is this tiny little village with a beautiful coast. The waves were crashing majestically (see pics from yesterday on fb) and I realized again how very much I miss ocean. There is something about the crashing waves, the roar of the surf, the hypnotic drawing in and out of the tide that I think must be very close to what we feel in utero, as we lie still and trusting in amniotic bliss. Maybe this is why the oceans always calls to me; it speaks of new beginnings, birth and rebirth, and the trust in the universe to care and nurture for me. At Finisterre, we all had our pictures taken with the iconic Camino cement mile marker showing 0.0 as the official end of the Way. And as I stood out on the bluff overlooking the ocean, as near to the end of the world as I could get, I understood why the Romans felt that way. Looking out at the ocean and seeing only the deep, deep blue (and in Galicia, where I completely lucked out with very sunny weather, but whose normal weather is rain and storms) it would be easy to think you were at the end of the line. Where else would there be to go? And now what, once you’ve reached here? We stopped at a couple of other places on the way back, including the only river in continental Europe who joins the ocean as a waterfall. And though it was not as far out as Finisterre, that had an end of the world feeling to it, as well. It pours forth over a cliff of rocks and enters the Atlantic Ocean gustily, with a certain sense of bravado. (Again, see pics on fb yesterday) I stood where a finger of the river was pouring into the ocean, though not as forcefully as the main body of it. Enchanted, I dipped my hand into the water as it poured over the rocks, just before it joined the sea; it was fresh water, no salt. I was fascinated by that. By how once it joined the Atlantic, it’s whole DNA would be overwhelmed with the vast body of water it had been pledged to since its birth as a stream somewhere high above the sea. Fresh water, salt water, just a few rocks separating them. As we drove back to Santiago, I thought about the river and the sea, the pilgrim and the Way; the way we our changed in our sojourn on this earth; none of can escape that fact. Jamie, another pilgrim friend, reminded me that there is a saying that the Camino begins when it ends; the journey does go ever on. Once you think you’ve reached the end of the world, you find a new world, or a new path to walk upon. And so it goes. 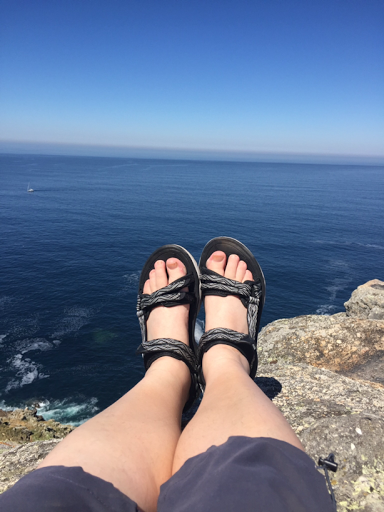 Of course, there’s more to write about this Camino I’ve been on, more insights, miscellany about the mundane events of every day, but I will save that for another time. It seems fitting that I should end this post from the end of the world with one of the first poems David Whyte shared in his workshop that led me here. no matter how, over the waves. I am enjoying reading your Blog while on the Camino. 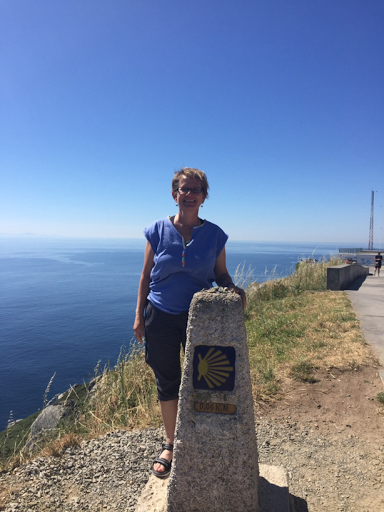 My cousin Judy and I have been training for our Camino since August 2015 and will leave for Spain on August 24th. Would you be willing to share with us which company you used to transport your luggage and how you went about making Hotel reservations from place to place? We plan to stay in hotels as much as possible. Blessings from Poverty. Blessings from Power.